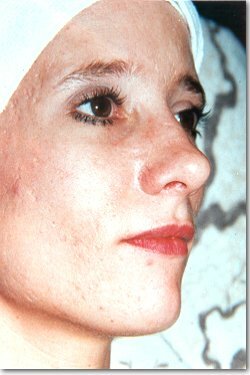 Skin peels are known to regenerate new surface skin. Most peels are formulated to help dissolve dead and dying surface skin cells without damaging regenerative layers. When used progressively as directed most skin can take on the appearance of healthy youthful looking skin for TODAY, TOMORROW & ALWAYS. Most skin peels are composed of acids; AHA, lactic acid, phenol acid, retin-A and glycolic acid are some of the more popular. The objective is to topically apply a product thus speeding up the skin's natural process of exfoliation, which can also slow with age. Gary Grove, Ph.D., vice president of research and development of Philadelphia's Skin Study Center states "the acids dissolve the glue that holds the dead cells to the skin." Removal of surface dead cells activates a generation of new skin cells, thinning and smoothing the upper skin layers. What is the difference between one peel and another peel? Lactic acid peels are derived from dairy products. Phenol is extracted from coal tar. Retinol is a highly concentrated Vitamin A substance. AHA and glycolic acid comes principally from vegetable sources such as fruit and sugar cane. Do peels work the same on all types of skin? Because each individuals skin reacts differently, no particular acid peel is universally effective. Reactions can occur even with some non-prescription over the counter products that are low in strength, due to an allergy to acid derivatives. For a majority of people, peels can be tolerated and beneficial to the skin. As a beauty and health care specialist, Florence Johnson, RCI, highly recommends a 24-hour patch test before any type of skin care treatment. Care should be taken with some individual skin conditions because peels, of any kind, may not be tolerated on some skin or can compound into the skin if used too often. In order for the peel to be of any benefit it must affect the skin. Glycolic peels have dominated esthetic news, because they seem to produce results with relative safety. There is however, no way to predict the safety or effectiveness for any particular individual. Skin peel products and treatments professionally administered with higher strength acid percentages are considered cosmetic procedures and also carry a serious price tag. In professional clinical settings when monitored to individual sensitivity, peels have been used at very high concentrations. When properly administered they stimulate surface skin, encourage oxygen production to regenerative skin layers and stimulate surface skin function. On the other hand, caution should be taken on extremely tanned or dark skin because the higher strength phenol peels can lighten the skin. Commercial skin peel products sold over the counter are thought to be somewhat less expensive. Using an effective lower phenol peel is the best solution for the consumer unfamiliar in navigating the field of skin care products that may or may not fit the individual skin type or budget. Sold nationally and internationally with positive results, with 50+ years in the beauty and health care field FANIÉ's Unveil Skinsation has become one of the most popular products within the history of the company. Formulated by using a cosmetic phenol based solution it has shown to be effective with skin showing the appearance of blackheads, whiteheads: pitted skin, scars and fine lines. As part of the FANIÉ individualized program the appearance of healthy, radiant looking skin can once again be yours progressively. See and feel a difference from the very first use. Use as directed in concert with other FANIÉ products.